Barbados, St Vincent, St Kitts and Nevis, Belize and Grenada along with other Caribbean countries are the latest victims of top heavy government bureaucracies that have crippled their economies; bringing them to the brink of financial insolvency. Although the politically connected intellectuals and media are quick to point fingers at exogenous factors; including the global financial crisis, declines in tourism etc., they neglect to highlight the state's complicity in dragging their nations into national bankruptcy. The reality remains that their economies and populations are too small to sustain the massively bloated government apparatus that is maintained at the expense of the working population. The public has been conveniently misled about the primary cause of inflation. The interpretations and definitions have been deliberately obscured so as to hide the destructive policies of Central Banks at the bequests of their governments. Typically inflation is described as; a general increase in prices; however the full definition is conveniently ignored i.e. a continuing rise in the general price level usually attributed to an increase in the volume of money and credit relative to available goods and services. 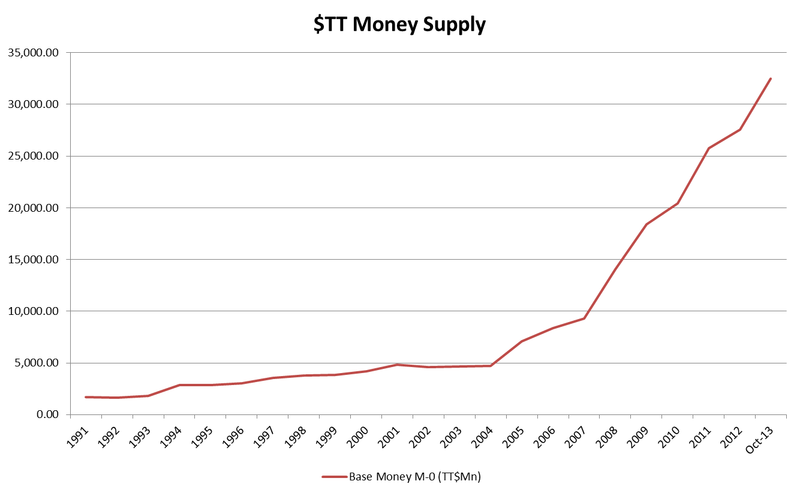 The T&T money supply ($TT dollars in circulation) since 1991 has increased annually at an average rate of 15.5% and is the core driver of inflation. The police can't be everywhere at once therefore they can't stop all criminality. Once this premise is accepted the primary way the police / the government can safeguard public safety is by arresting and prosecuting perpetrators of reported crime, thereby limiting the criminal to a single violation rather than repeated violations of the public. The current low detection and prosecution rate is the fundamental problem and consequently the police along with the judiciary are culpable. This core responsibility of the police service and judiciary to administer justice has been largely ignored and is directly contributing to unabated criminality. To quickly counter the recent surge in murders the following policies should be implemented. This will minimize the wastage of police resources on the policing of small time narcotics and allow the police to assign more officers to investigate and prosecute actual crimes, increase detection and conviction rates. This approach would also reduce marijuana premiums paid, thereby making the marijuana trade less attractive to traffickers and criminal gangs.